The Needle and Grenadier Ranges rise dark in the north. 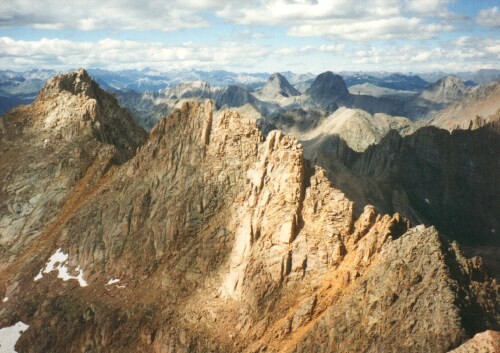 Peaks in this direction bear names such as Gray Needle, Jagged Mountain, Knife Point, Arrow Peak, Storm King, Leviathan. The Grenadiers consist of upthrusted blocks of Precambrian Quartzite and slate. The Needles, of which Windom and Sunlight are members, are the eroded remnants of an intrusive igneous stock that was implaced 1.46 billion years ago.